11/30/07, Oak Street Cinema: Twenty years ago, during Chet Baker's final year on this planet, celebrity fashion photographer Bruce Weber made this compelling and deeply creepy film about him. The James Dean-handsome trumpet player of the early 1950s had become a drug-ravaged shell; bobbing in his littered wake were dreamy recordings, kids he didn't know or care about, women who loved him despite his abusive behavior, friends who had been conned, myths, legends, and a mother who looked away from the camera and refused to answer when Weber asked if Baker had been a disappointment as a son. Weber spent a million dollars of his own money to make the film; he'd been a fan of Baker's since he was 16. What started as a photo shoot and a three-minute film turned into a full-scale documentary; perhaps Weber, too, was conned by the narcissistic Baker. Born in Oklahoma, blessed with good looks and charisma, struck by the lightning of musical genius, handed fantastic opportunities (at 22, he played with Charlie Parker and Gerry Mulligan), Baker became addicted to heroin, was jailed in Italy, arrested in West Germany, deported from England, eventually banned from much of Europe, made a comeback at Carnegie Hall in 1974, and fell to his death (or maybe not) from a hotel window in Amsterdam in 1987. But listen to him sing "Embraceable You" or play "My Funny Valentine" and you'll feel all woozy. When the lights came up at the end of the film, most of the audience at the Oak Street looked wrung out and stunned. Four words looped through my head: "Wonderful music, horrible man." The film, in eye-popping black-and-white, has been unavailable and unseen for years and was recently restored by Weber himself. It comes out on DVD in December. Read a review of the film and an interview with Weber. Read more about the film and see the trailer. The Chet Baker Web site. 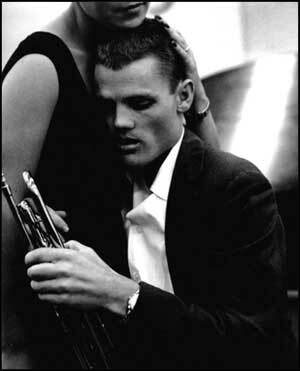 Photo of Chet Baker by ??? I found it on a Bulgarian Web site (which I used to link to, but now the link leads somewhere even more suspect) and would not be at all surprised to learn it's there illegally. I'll happily include a credit if someone knows where this came from, or remove the photo if I've done a bad thing. More (added 3/11/09): Filmmaker Bruce Weber writes about how "I'm still looking for another Chet Baker in my life."